The oldest standing Catholic church building in Nevada has found herself in the middle of a new chapter in life. 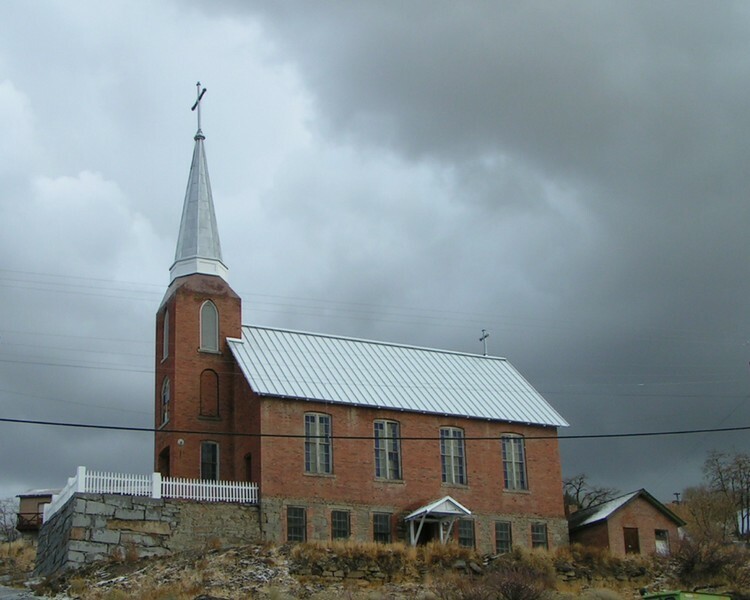 St. Augustine’s Catholic Church of Austin, Nevada, had its beginning in August of 1866. The land was donated, and with volunteer hours from locals, the doors were opened in a dedication service that Christmas. Built on a prominent hill, the west-facing building is strong and dominating. She radiates a strong historic appearance that cannot be missed as one drives through town. The wood and tin-clad spire rises seventy-five feet, making the structure seem very tall. Built into the hillside on solid granite, both the bricks and granite used in construction were from the Austin quarry and brickyard that flourished in the 1800s. The cost to construct the original building was $50,000, quite a sum in those days. In late 1930, Tahoe artist Raphael Jolly painted fourteen breathtaking murals on the interior walls. St. Augustine’s continued her Catholic services until the 1980’s. Then she fell into desuetude and disrepair. The year 2004 began yet another chapter for her when, then local resident, Jan Morrison purchased it, then deeding it to the non-profit with intentions of restoration and turning it into a Cultural Center for not only Austin but for all of Central Nevada. Her new purposes are to support historical tourism, arts shows, artist workshops, historical presentations, docent tours, and musical performances. It is also offered for use by organizations and individuals. The Performance Hall, with it twenty-four foot shed-style ceiling was built for the purposes of carrying sound beautifully. Original pews can hold up to 200 people, and the former altar area now has a stage. The lower level houses the Banquet Hall and a small commercial kitchen. The Banquet Hall is suitable for workshops, meetings, seminars, and other gatherings, such as receptions and reunions. Not only is St. Augustine’s the crown jewel of Central Nevada, she holds yet more precious stones. A Henry Kilgen (1821-1902) organ sits proudly overlooking the pews and stage. This is a rarity indeed, as it is one of only two to survive that were built by Henry Kilgen. The Austin instrument is also the only known surviving Henry Kilgen organ that is tonally, mechanically and visually intact. It was of utmost importance to preserve it without changes in order to maintain a representative example of his work in existence. 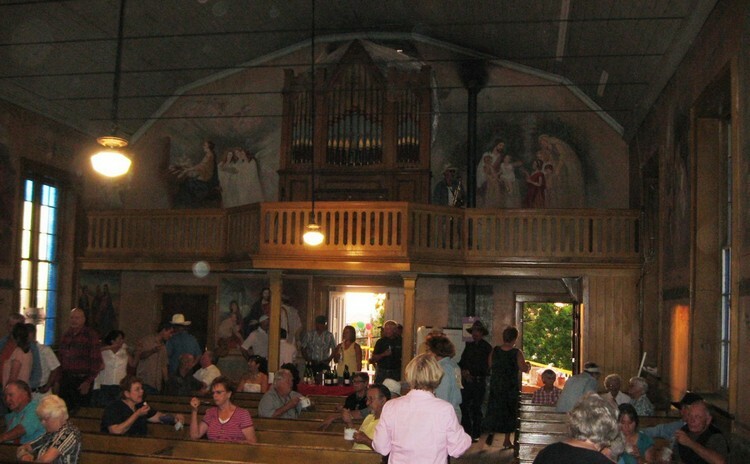 In 2009, Howard Bennett of Washoe Valley, Nevada and Michael Friesen of Denver, Colorado made a trip to Austin to see if, in fact, there was a true and unique Henry Kilgen organ at St. Augustine’s, and upon discovering its authenticity, there began a five-year journey of restoration that came to fruition in 2014. Charles Ruggles of Conifer, Colorado was chosen to do the restoration. With over a million dollars in grants funds used to update the building and the completed restoration of the organ, 2014 saw the re-opening of St. Augustine’s new life as a Culture Center. For approximately the next three years, it would be used for its intended purposes, until again, the consequences of a busy life found her caretakers searching for the next kindred spirits to step up and oversee her care. In June of this year, a new Board was voted in, with the exception of Nancy Gordon. Another chapter has begun for the beautiful St. Augustine’s, and one can almost feel her smile at the future. While her past has been filled with people dedicated to her, people that have loved her and worked hard to keep her stately history alive, the new caregivers have taken up the baton in the race and are carrying it with enthusiasm. They look forward to sharing all her history, all her beauty that’s in the paintings, the organ, the pews, the bell tower that greets you as you walk in, chin lifted high in the hopes of getting a glimpse of the bell tower, and the fantastic acoustics in the Performance Hall. They want everyone to see what a Crown Jewel there is in the fun, fantastic town of Austin, Nevada. If you have any questions or inquiries, you are welcome to contact the board members, Guy and Lynda Seymour, Paul and Sharon Tremayne, Nancy Gordon and Brad and Kathleen Bouillon by e-mail at Staugustines@yahoo.com. As with anything new, further avenues of contact such as a phone number and a website are being established. She does have a Facebook and Instagram page and is a member of the Austin Chamber of Commerce.